What better way to kick off my series of Whisky Live previews this year than with a local whisky hero, Andy Watts, who is the master distiller at the James Sedgwick Distillery in the Western Cape – home of Three Ships and Bain’s Cape Mountain Whisky. WTF: Hi Andy, what is your take on Whisky Live SA and the SA whisky community? AW: I think they have both come a long way in a relatively short period of time. If you think back 11 years to the 1st Whisky Live in a marquee tent in the V & A Waterfront in Cape Town with 300 people to what is now the biggest Whisky Festival in the World that is amazing. The SA whisky community has also evolved at the same rapid pace from being interested solely in a few days of whisky indulgence to now having a solid education and interest in whisky. We also, in South Africa, have some of the more active whisky bloggers who love to share their passion and interest in this fabulous subject with everyone. I think we are in a good space at the moment! WTF: Which you be attending both the Soweto and Sandton legs of the festival? AW: I will be attending both of the festivals this year! WTF: What will you & Three Ships be doing at Whisky Live? Can you give us more info on the workshops you will be hosting at the Sandton leg? AW: I will be kept busy with media interviews and also with the 2 workshops I will be giving at the Sandton event (see the whisky workshop details here). WTF: Which Three Ships whiskies will be available for visitors to taste at the festival? AW: There will not be a Three Ships stand at this year’s Festivals but I will be doing tastings of the full Three Ships range as follows. 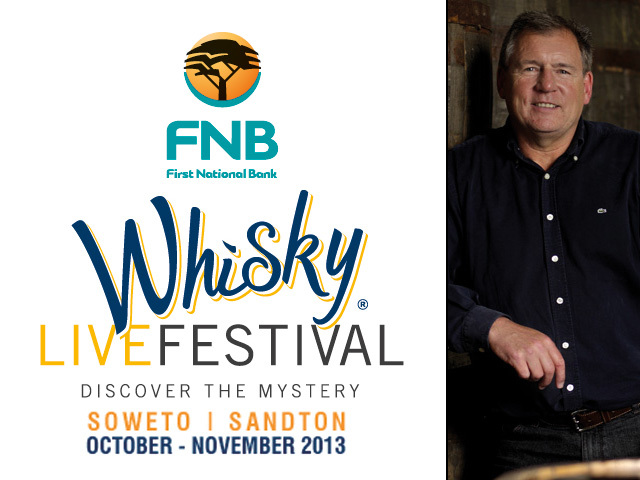 The FNB Tasting Room is now called the Whisky Live Festival Tasting Room and is open to all who attend the festival in Sandton on a first come, first served basis. WTF: And I believe some lucky attendees will get a chance to sample some work-in-progress whiskies that you’ve drawn from specially selected casks? AW: I thought it would be a good idea and different to show some whiskies which highlights our continuing drive towards innovation. Whiskies which have not yet got brand identities but which may very well one day be brought to the fore. WTF: Are there any plans to launch a new Three Ships or Bain’s expression soon? Or perhaps a whisky under a new label? AW: A question which continually pops up. 🙂 There will definitely be further expressions of both Three Ships & Bain’s going forward but what these are and when it will happen has not yet been determined. It all comes to he who waits! WTF: Demand for your whiskies appear to have shot through the roof following on the 2 recent World Whisky Awards. Are you able to produce enough to keep up with demand? AW: We have the same issues as the rest of the whisky producing world which is that sometimes demand exceeds the forecasts drawn up in years gone by. You manage this the best you can and develop new plans and forecasts for the years going forward. Very rarely do you sit in a surplus stock situation when markets are vibrant. WTF: I see that you’ve broken ground on another warehouse – how many casks will you have maturing on site once it is completed? AW: Yes we have just started construction on another warehouse and when completed by January 2014 we will then have well over a hundred thousand casks at the distillery. WTF: Any plans to export Three Ships abroad? I’ve been seeing some rave reviews coming out from the UK recently. AW: I continue to say during my tastings that if any person just drinks one whisky then they are doing themselves a disservice! Whisky is a journey and the whole fun of the journey is taking that first step and then creating your own road along that journey. I do not believe that there is one whisky which suits every occasion for a myriad of reasons. Therefore I tend to spend quite a bit of time looking at different whiskies and ones which have been encouraged through innovation. I try to form ideas as to the right time and place to enjoy these whiskies as well as also learning for any future development of our own whiskies what may work and what may not. WTF: Following on from that, what is your favourite Three Ships whisky, and why? AW: Three Ships Premium Select 5yr remains my favourite and this is due to my much reported working visit to Islay in the late 80’s and the development of this whisky on my return to SA. In my opinion it has the ability to offer the illusion of being older than its 5yrs whilst delivering a flavour profile which with creative thinking puts me back on the shores of Loch Indaal. WTF: And in conclusion, what is your favourite non-Three Ships whisky and why? AW: Islay whiskies and in particular Bowmore remain up there with my favourites but at the moment I am really enjoying the Deanston 12yr. A very easy drinking which is soft, well rounded and has a slight sweetness. Another of the Deanston malts I am enjoying at the moment was a special bottle brought back for me by a friend after a recent visit, the 15yr Old Toasted Oak expression. Only 690 bottles released and a real flavour explosion which takes you on a completely different journey as the 12yr. Thanks for your time Andy! Get yourself to the festival folks! Andy’s stash of cask samples are things of beauty and show great promise of what is yet to come from the James Sedgwick Distillery. Coupled with the internationally awarded Three Ships 5yo and Bain’s Cape Mountain Whisky, it looks as though Andy and his team are going from strength to strength. So don’t wait a few more years to discover our locally produced liquid gold, rather attend the festival and start your love affair now.